Computer culture and gun culture, ctd. If only one person in a thousand was willing to pay $1 to see some government slimeball dead, that would be, in effect, a $250,000 bounty on his head[…] Chances are good that nobody above the level of county commissioner would even risk staying in office. Just how would this change politics in America? It would take far less time to answer, “What would remain the same?” No longer would we be electing people who will turn around and tax us to death, regulate us to death, or for that matter send hired thugs to kill us when we oppose their wishes. This all sounds like the sorts of rant you hear these days from the extreme gun nuts. So maybe the analogy is not that far-fetched. And, come to think of it, now that concrete schemes are afoot to turn weapons manufacture into a software problem with 3d printing, even the technical differences between guns and codes are dissipating. Author steinsaltzPosted on May 27, 2013 September 1, 2014 Categories PoliticsTags cryptography, gun control, history, technologyLeave a comment on Computer culture and gun culture, ctd. How much do BART police earn? I have great affection for BART (Bay Area Rapid Transit, to the uninitiated), and I have no criticism to make of the BART police. 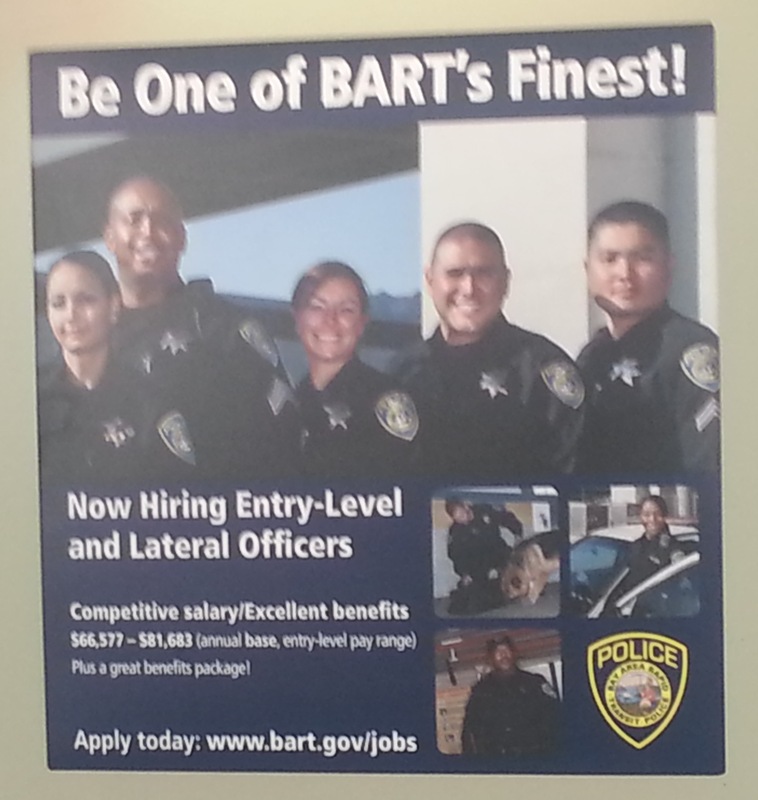 That said, I was somewhat astonished a few months ago when I saw an advertisement for BART police recruits much like the one below, except that it quoted numbers well over $100,000 for the salary range. I think they deserve to be well paid. They have a difficult and dangerous job, and they spend so much of their lives down in gloomy subway tunnels that (to judge by the evidence of the photo below) they are left blinking in stunned amazement when they are summoned up into the light of day to be photographed, and all but one seem to have had their growth stunted. Obviously I wasn’t the only one who was surprised. They have now put up exactly the same poster, but with numbers barely half as big, and now supplemented with the word base in bold-face type modifying “annual base, entry-level pay range”. Boldfaced type really stands out in this context. Particularly with the comma after it. That line looks like the typographic incarnation of embarrassment. Author steinsaltzPosted on May 23, 2013 May 23, 2013 Categories UncategorizedLeave a comment on How much do BART police earn? More comments on Andrew Wakefield and the MMR-autism hoax here. I once was at a parents’ meeting in Oxford where a homeopath had been invited to speak. I was genuinely nonplussed that she was raving against vaccines. Aren’t vaccines the one great success of the homeopathic world-view? Giving a tiny dose of the disease-causing agent to cure (or prevent) the disease. Her answer was incomprehensible to me, but seemed to suggest that the very fact that there was a measurable physiologic effect showed that they weren’t any good (from a homeopathic perspective). And the fact that pharmaceutical firms made the vaccines was all you needed to know about their chthonic nature. I fled the meeting in revulsion when the homeopath started prating about homeopathic cures for tetanus. So, you’ve just been hit by a bus, and you’re lying bleeding in the gutter. Naturally, what you’re thinking about is, what would be the most convenient place to get a couple of pints of blood, and maybe have a ruptured spleen removed. Sure, the ambulance drivers might know the closest one, but I’m going to insist on being taken to the best, and what better recommendation could there be, when your life is at stake, than a placard on the side of a bus. (Anyway, the EMTs probably have a remunerative arrangement with some other hospital that will pad their incomes, regardless of whether you survive the trip.) And while I’m paying thousands of dollars a day just for being in the bed, I can think about how my money is being put to good use subsidising mass transit. Seriously, isn’t this beyond bad taste? 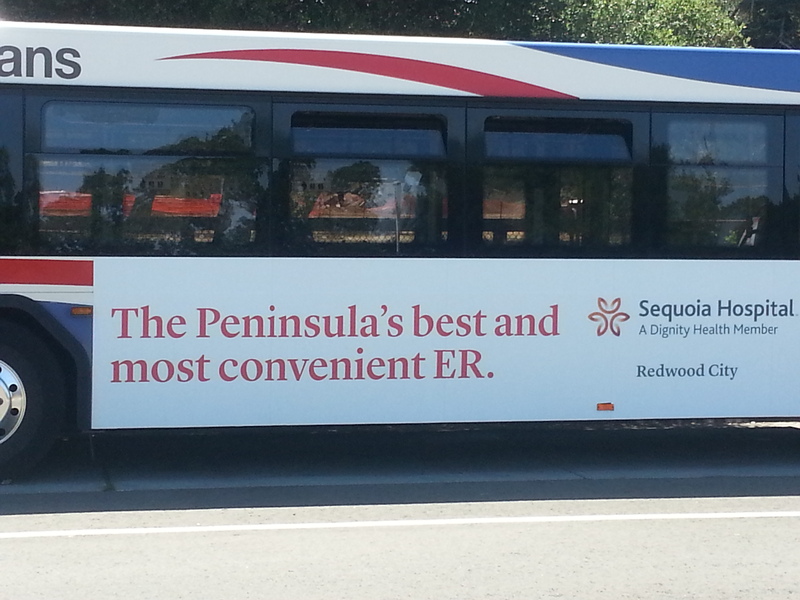 I’m used to a medical system that advertises to, you know, inform the public about medical matters. Not to drum up business for the ER. I’ve mocked the sometimes risible implications of the British obsession with tying academic research one-for-one with “impact” on industry or society. It’s not absurd to want to ask the question, I would argue, but expecting to be able to get answers about impact on the fine grain that is needed for steering funding decisions leads, I suggest, is a fool’s errand. There is also a (not very) hidden political agenda behind impact: Research that elucidates the origin of the Himalayas or the inner workings of modern religious movements, let us say, has no impact unless the BBC makes a documentary about it. Research that helps one bank increase its market share over another bank by better confusing its customers is rewarded for its impact, because definable (and potentially grateful) people have made money from it. Nonetheless, the British establishment is not so crass as to suppose that helping to make money is the only possible utility of research. The UK research councils are at pains to point to the multiple “pathways to impact”, through changing public understanding, government policy, health benefits, education. For some purposes, even something as useless as influencing the progress of science can be counted as impact, though it fail to swell the bank account of even the smallest party donor. We want business-driven, industry-relevant research and development. Exile in the modern world: Can a country deport its own citizens? One of my favourite novels is B. Traven’s Das Totenschiff (“The Ship of the Dead”). Written in the mid-1920s, this novel tells the story of an American seaman who accidentally gets left behind with no papers when his ship sails from Rotterdam. Suddenly he is a stateless person. He tries to get help from the US consulate, but gets a Catch 22-like sermon, along the lines of, “I would of course help an American citizen who was stranded here without papers, but I am unable to assist you without proof that you are indeed an American citizen.” All the officials he encounters treat him as some sort of ghost, a man without identity papers being a contradiction in terms. (This reminds me of Bertrand Russell’s comments on the imposition of passport requirements for international travel after the First World War, a tyranny that until then had been thought characteristic of Russian despotism.) Since no one wants to deal with a ghost, they find ways to dump him across a border, taking him further and further west, until he lands in Barcelona and ends up being signed on, not entirely willingly, to the Yorick, a ramshackle ship, a floating hell of labour, crewed by other unpersons from all over the world, its hold stuffed with useless cargo that is just being carried around the Seven Seas in the hopes that it will eventually sink and yield an insurance payment. Anyway, I thought of this surreal novel when I read the recent New Yorker article by William Finnegan, about a US citizen with a minor criminal record and mental disabilities who, for no reason that anyone can reconstruct, was targeted by ICE (Immigration and Customs Enforcement) for deportation to Mexico. He was born in the US, had never been outside the US, was not Hispanic, but somehow when he was booked into a state prison for a short sentence his birthplace was listed as Mexico, and that was enough to get him deported to Mexico less than a year later. And the Mexican authorities, since he wasn’t Mexican, managed to ship him off to Guatemala. He eventually got returned to the US, though more by accident than design. When he flew into Atlanta, with a passport issued to him by a vice consul in Guatemala City, the immigration officials there noted that he had already been deported and had him arrested, intending to redeport him. Author steinsaltzPosted on May 11, 2013 May 26, 2013 Categories Criticism, PoliticsTags literature, migration, US politics1 Comment on Exile in the modern world: Can a country deport its own citizens?